Makara Sankaranthi is an ancient Hindu festival, celebrated with enormous enthusiasm and passion, to commemorate the harvest and to thank the Sun God , Surya for his benevolence. This festival often falls on January 14th every year. This festival is the indication of the arrival of spring across our country. This festival marks the event of the Sun entering the sign Makara (Capricorn ). Makara Sankaranthi also indicates the commencement of Uttarayana, a six-month auspicious period of the Sun’s movement towards north. This day of January 14th is very auspicious, as Tamilnadu celebrated this day as Pongal, and in Punjab it is celebrated as Lohri and Maghi. Flying kites are considered as one of the major part of the celebration, where everyone involves with enormous enthusiasm. When the absolute divine is the guiding force of the life, the path of life is constantly orchestrated to path of ultimate joy. Sanatana Dharma takes the mankind to the ultimate experience of reaching the heavenly abode. It is very auspicious to take a dip in the river bank. People from the states of Haridwar, Uttar Pradesh and Patna celebrate it with enormous interest. Surrendering ourselves to higher consciousness, will elevate mankind from the Karma. The Sun has very important place in the Hindu’s philosophy. He is the abundant source of energy for all the living things on this planet. 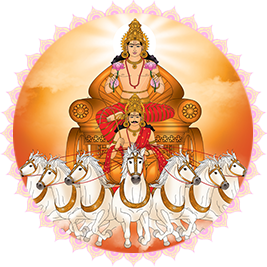 Yama, the god of Death and Sani, Karmic planet who is also the ruler of Makara Rasi (Capricorn ), are the sons of Surya. There was an eclipse when Sani was born. On the day of Makara Sankaranthi, Surya visits with Sani. So, people are celebrating this day with great significance which marks the unity among the family members. On this day, Lord Vishnu invaded the Asuras in the Mountain Parvata. This signifies the end of negativities and the beginning of righteous living. The day of Makara Sankaranthi is very auspicious, as people across the globe celebrate on this day with different festivals in different regions. People also associate harvest and agriculture. They offer their gratitude to the Sun God . On Makara Sankaranthi, people used to go to the river beds, and offer their prayers. Prasadams are also made using sesame seeds and sugar or Jaggery. They cook sumptuous food in the clay pot, and offer it as a prasadham. The boiled rice with the choicest of the lentils is garnished with ghee and Jaggery which is not only aromatic, but also highly healthy. The prayers are often done as a community, where the entire people gather and celebrate along with their families, friends and relatives. Sugarcane is an important ingredient in the festival. The freshly harvested cane is also offered as a Prasadam, and are eaten with enormous enthusiasm. It is the mark of the gratitude, and remains us to be thankful for all the benevolence bestowed on us. It is the mark of happiness, celebrated with the family and friends, which brings enormous unity. Special prayers are offered to the Gods, which brings enormous prosperity, happiness and abundance in our lives. You may think, dream, imagine, and hope to be a thousand things, but the Sun is what you are! To be your best self in terms of your Sun,..
Awaken the leader in you! Think out of the box. When you are meek with your actions or when others dictate terms to you,..